An ideal planting site has semi-shade with no direct midday summer sun. A suitable place would be on the north side of a structure or tree. Most Cypripediums are woodland plants and therefor prefer cool sites which do not become too hot and dry in the summer. Places where ferns thrive are also suitable places for Lady’s Slippers. Cypripediums need a well-aerated and free-draining soil. The addition of perlite can improve drainage and promote good soil structure. Do not add manure or used manure-based compost. Compost should not be used as a replacement for mulch. Artificial bogs and other specialty beds are not necessary to grow Cypripedium. Spread out roots in the upper four inches of soil and the rhizome one inch below the surface of the soil. Fill in the remaining substrate without compressing it and water thoroughly. The soil should never dry out completely during active growth. 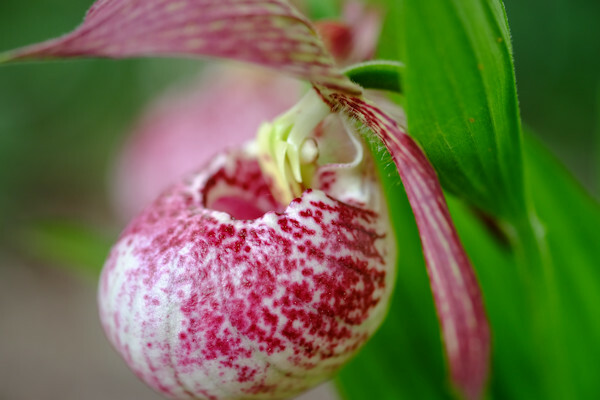 Fertilize your Cypripedium regularly during springtime using fertilizers in half concentration. Mulch in the spring can help maintain moisture and keep the roots cool throughout the summer. Good mulch consists of wood chips of varying sizes, leaves and conifer needles. A good mixture of organic matter will remain fresh longer and reduce rot due to stale conditions. Avoid cedar chips which contain allelopathic chemicals (growth inhibitors). Cypripediums do best with slow growing Ferns, BarrenWort and Trillium species. They cannot compete with vigorously growing perennials, trees and shrub roots. Lady's Slippers will thrive in a shade bed with ferns and smaller growing perennials. We love them with Trilliums, Hepatica and … well we love them with just about anything! Cypripediums are hardy plants in the Canadian climate and are built to completely freeze in the winter. A layer of mulch will help prevent dormant shoots from drying out and/or becoming exposed to the elements due to erosion. Slugs are the number one pest for Cypripediums. Special attention should be given during early spring as new shoots emerge from the soil. Below are links to a few videos that provide additional information on caring for your Cypripediums.